WINDOW ROCK - It took almost 59 years for Navajo Code Talker Teddy Draper Sr. to receive his Purple Heart and commendation. Draper, who will be 81 years old on April 2, on Friday said that the Purple Heart revived him. According to a March 2 letter from the U.S. Veterans Administration, the VA admitted that they had made a "clear and unmistakable error" on May 17, 1946. That was when they decided that his hearing problems were not war related and denied his claim for compensation. Draper said he won his right to 100 percent disability with the help of his pro bono attorney, George Parker, with a law firm from San Antonio, Texas. to him free of charge after he heard him talk about the Navajo Code Talkers and his battle with the VA for war-related benefits two years ago. Draper's documents also show that Parker helped him win his claim for post-traumatic stress disorder in February 2003 and retroactive pay for PTSD from January 2000. The acronym PTSD made Draper shut his eyes tight, put his head down, wring his hands and stop talking. 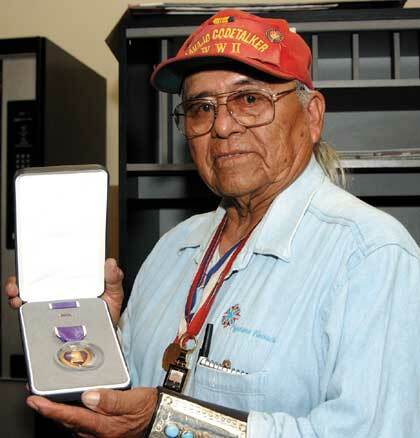 He said many of the Navajos who served in World War II suffered from PTSD. Draper slowly said, "It's hard. When it starts coming on me, I can feel it and I go where there are no people, no noise. I get quiet. "I want to be by myself. The thing is I get lonesome. When I get lonely, I know I'm sick so I have to go to a bar and take a drink - not to pass out but just to forget things. "That's how PTSD feels. That how a lot of boys (veterans) feel and they drink, drink, drink, to make themselves feel comfortable," he said. "And then all that noise comes. I can see shadows on my side. I can hear a lot of different kinds of guns. But now I'm all right. I can hold it," Draper said as he shut his eyes again and put down his head. He remembered that for 10 years after his discharge on May 16, 1946, "I was bad. I liked to cuss. I'd cuss anyone." He said he was lucky he had a job and traditional Navajo ceremonies, such as the Enemy Way, to help him with his PTSD. But when the "war disease" gets really bad and the VA doesn't listen to veterans and denies benefits then nothing helps, said Draper. He said he hopes for the sake of veterans of the Iraq War that the VA understands PTSD and that the veterans earned their benefits. "Nobody's ready for those (Iraq War) veterans when they come home," he said. Draper remembered when the Navajo Code Talkers returned home and they only had each other to talk to about the war. "We talked about how we fit in and the war disease. But a lot of them died from it. A lot of them kept drinking," he said. "In our way, our tradition, our way of thinking, if you shoot a man, he comes on you when he dies," he said. "It will come back again and it will kill you because that's the law in Navajo way. You don't kill people. It's not superstition. That's the way it is. "But who says kill these men? It's our own government," he aid. "So we make sin. Even with a lot of prayers for us, it's still a sin. We can't get away from it." He said the Purple Heart helped him but the VA still doesn't believe that his eye, nose, stomach and heart problems are war related. Draper said he was stringing radio wire with two other Marines on Iwo Jima when the Japanese started firing artillery shells. He heard a mortar shell dropping and yelled, "Cover!" A few seconds later, he heard and felt a horrific blast and he couldn't see or hear anything. Draper said two medics found him and tried unsuccessfully to stop his nose from bleeding. The shell hit about 15 feet behind him and instantly killed one of the two boys helping him lay wire, he said. The other one died in the evening. Draper said his company had three other Navajos - Jimmy Preston, James Cohen and Frank Toledo. Preston was a good policeman but he never stopped drinking, he said, and died in a chapter house from exposure. Cohen was run over by a train in Gallup, N.M., and Toledo died in a hospital in Albuquerque from tuberculosis, he said. 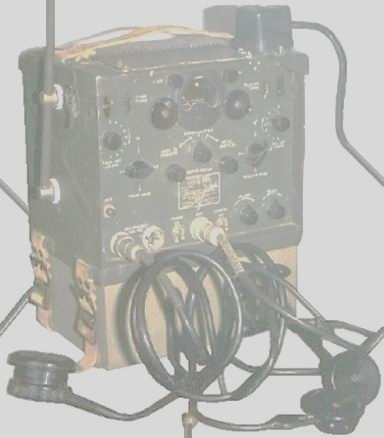 Draper remembered that Navajo Code Talkers Paul Kinlicheeny and "Notah" were laying down sending messages on "Iwo" when a Japanese blast killed them. He said that for the Navajos, Iwo was the island that took the most casualties. According to Draper's the Purple Heart commendation, "The President of the United States has awarded the Purple Heart established by General George Washington at Newburgh, New York, August 7, 1782 to Corporal Teddy Draper, United States Marine Corps for wounds received in action on 20 February 1945 on Iwo Jima.